Bit of a gasp here when I saw what this week's challenge is over at Less is More - 'Use a Stencil'! Time for Rudolph Days over at ScrappyMo's - it runs until the end of the month so, although I'm a bit late, you still have at least two days left to join in! 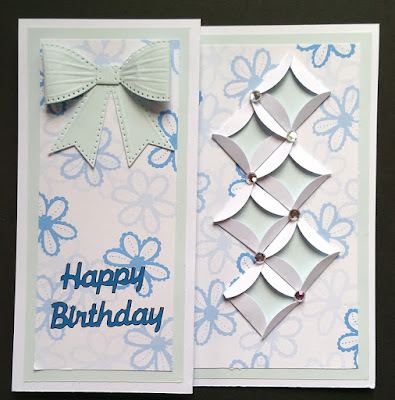 Bit of a cheat this week 'cos my Sunday Snippets card made an appearance on Tuesday, as my DT card for the new Cuttlebug Mania 'Midsummer' challenge. I always think that patterned paper snippets are perfect for paper piecing and this darling card, made by Heather, is a perfect example of how just a small snippet paper pieced onto a dress suddenly pulls a whole card together beautifully. I do so like the way Heather used the Polaroid frame with the perfect sentiment too! This great New Home card, brought to show us by Janice, really caught my eye. Such a clever design with the offset square aperture and the sweet little key. The scen is perfect isn't it - and it really brought home (no pun intended) to me how I, rather foolishly, keep my landscape dies just for Christmas cards. Need to rectify that one for sure! Meena is such a talented young woman, despite being as she so well describes it 'differently-able', and this beautiful tribute to her Mum really made me well up. 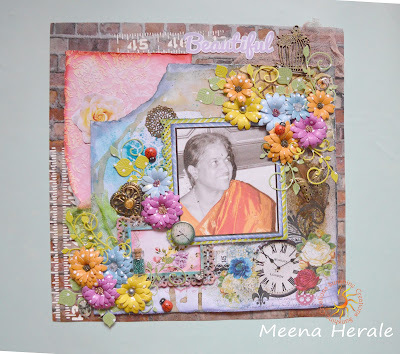 Great use of snippets and so much work and love has gone into making this layout - you're a star Meena! I think this Christmas card, brought to share by Loll, is absolutely stunning! 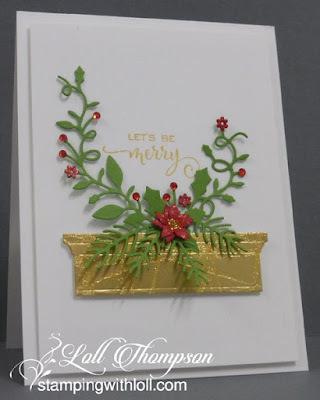 So elegant and although it looks almost effortless, when you read how Loll made it, as well as studying all the beautiful details, it's clear that a lot of thought and great care went into this fabulous card. That reminds me, it's Rudolph Days over at ScrappyMo's right now - until 30th June. I'll be playing on Tuesday and it would be lovely if you could join in as well. Congratulations Helen! I know that you've often been a weekly pick since first coming to play last year, but it's around eight months since your previous prize win - so, well done! I have your address here (hope it's the same as last August?) and will pop your prize in the post this coming week. There's a Crafts-Too 'Lattice' embossing folder, an Inkylicious sentiment stamp called 'Wonderful Day' and a Joanna Sheen 'Fuchsia' dies set up for grabs. Either all as one prize or it can be split. The Snippets Challenge will run for one week and the Playground gates will close at 11am UK time on Saturday 2nd July. The gates will open again at midnight UK time on the same day. A maximum of ONE entry and please say in a comment if you wish to play and be a possible winner of the prize. If you only want to play for one or two of the items making up this week's prize, just say so in your comment and if you win then I'll do a further draw for the other item(s). Please also link back to the Playground in your blog post to be eligible for the draw. I'd like to enter this card into the current challenge over at Craftyhazelnut's Christmas Challenge 286, where it's 'Cute or anything goes' this week. Am also linking into Craftyhazelnut's Christmas Challenge Extra for June, where it's always 'Anything goes'. 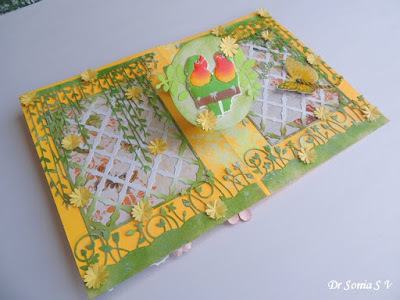 It's time again for a new fortnightly challenge over at Cuttlebug Mania - and the theme this time is 'Midsummer' to include flowers/floral wreath, just make sure you also include some die cutting and/or dry embossing. Details of our sponsor can be found over on the Cuttlebug Mania Challenge blog. There certainly was a hollow laugh here when I was making my DT card last week ..... whilst rain hammered on the windows. We'd love to see you over at Cuttlebug Mania, it's a great theme with plenty of scope and the challenge runs for two weeks. 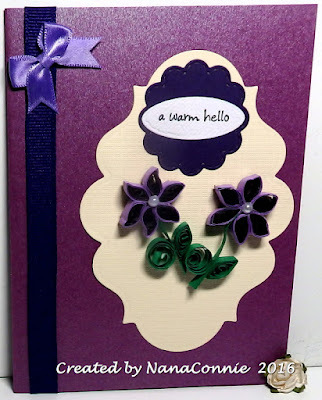 I'd also like to enter it into the CAS Mix Up June Card Challenge (my second time this month playing over at this fun challenge). 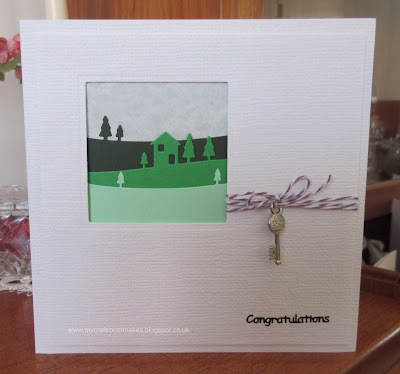 The theme this month is 'stamping + die-cuts ...... + my own choice of dry embossing'. And last but by no means least - the fabulous Allsorts Challenge Week 368, where the theme is 'How does your garden grow'. It's been far too long since I played over at Allsorts so I'm delighted to be linking up this week! Crumbs, I think that's record number of challenge entries for me with just one card. This is all of the Sunday Snippets post in one go, despite my earlier warnings - yay! Yesterday we were out at the local village carnival - from early morning, setting up and helping out with 'have a go' archery as well as wandering round the many stalls when given a little break! The weather wasn't too unkind, chilly at times but it stayed dry at least - and I must have been busy as the camera never made an appearance! The atmosphere was just as expected at a traditional English village event, even the local vicar was sketching charcoal faces to raise funds for the church and of course the village WI were out in force - selling cakes and jam. There were loads of rides and the usual fairground sideshows, as well as too much icecream, Cornish pasties from the village bakery and candy floss! Although very tired at the end of a long day, we both had loads of fun and a lot of laughs. There must have been a cider stall (as usual) but we never found it although, when I drove us home at the end after clearing up, there was a very 'wibbly wobbly' old biddy in shorts with various veined leggies (?!) and sporting blonde curls weebling along, totally oblivious to traffic behind her, on the narrow lane past one of the thatched cottages on our route :) Bet she'll sleep well tonight! I bet most of you will guess who this card was made for - hope you had a fabulous day hun!! I know that Jules is often a weekly pick, but I just had to show you this brilliant idea for using up snippet strips! Clever or what? Jules is blogging much more regularly now (goodness knows where she finds the time!) so there are loads of lovely cards appearing on her blog to inspire you. We have had pop up box cards in the Playground fairly regularly - I picked this one by Megan as I adore the little reindeer with the skyline buildings behind. Also, Megan has a really easy to follow tutorial on the blog post - well worth a read! Here's another fun card - shared with us by Cornelia. Plus, even better, there's a great tutorial showing how she made this - hop over to Cornelia's and follow the link. I know that Livi, Len's youngest grand daughter in Germany, would absolutely adore a card like this! Nancy sauntered in with this gorgeous scene to share. 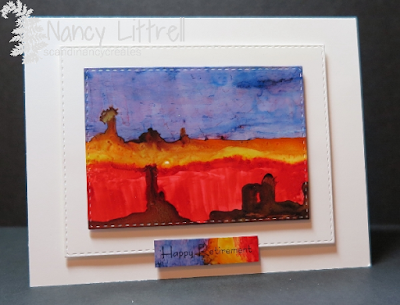 It reminds me so much of the sun setting over the hills and rock formations on an evening drive we did in New Mexico a while back - and how clever to add the sentiment on a snippet of the same background! Then Majda arrived, with this beautiful package to show us.There's no translation gizmo on Majda's blog but I'm guessing there might just be some chocolate hidden inside? And isn't the heart made up of buttons so cute?! This coming week's prize is also a bit of a bumper one and there's a little tale behind it. I quite often order stuff from Tara's shop called 'Seven Hills Crafts'. What I really love about about the shop is that, not only am I supporting Tara's business, but also she is one of the few UK sources of tons of USA produced goodies - notably dies and stamps, which would cost such a lot to order direct from the USA. The sets from left to right are 'Apologies', 'Smooches' and 'Graffiti'. The Snippets Challenge will run for one week (we're back to normal for the time being, yay!) and the Playground gates will close at 11am UK time on Saturday 25th June. The gates will open again at midnight UK time on the same day. A maximum of ONE entry and please say in a comment if you wish to play and be a possible winner of the prize. If you only want to play for one or two of the stamp sets, just say so in your comment and if you win then I'll do a further draw for the other item(s). Please also link back to the Playground in your blog post to be eligible for the draw. I'd like to enter this into Craftyhazelnut's Christmas Challenge 285 where this week's theme is 'Silver' - as well as Craftyhazelnut's Christmas Challenge Extra for June where it's always 'Anything goes'. The current theme over at Less is More this week is 'Splatters' - and it's one layer as well. To be honest I feel a bit of a fraud just stamping a few splatters and a sentiment and calling it a day, this is waaaay out of my comfort zone! It seems too quick to me, who takes hours making a single card. Also other people do it with great aplomb and get such fabulous results. Plus, it looks a bit like there's been some blood dripped onto the card - IMHO, sigh. But, I wanted the yellow and oranges to echo the word sunshine in the sentiment :) The in-house critic loved it though! I'm baaaaaack! And surprisingly the Playground didn't suffer any major disasters and Parsnip was very cool, calm and collected when he opened the door to the tree house for my inspection. Mind you, I did notice that his pockets were jingling with coins - so the little rascal had obviously been making some money on the side! The stamp set comes with various really fun sentiments plus a teeny heart, a life saver and an anchor - oh, and a stamp which would make great waves too. The life saver and anchor also have matching dies in the set I used - but it seemed a step too far to throw too much at the one card. I know that I originally spotted a similar card on a Playmate's blog and rushed off to buy the goodies immediately - quite a while ago now. Needless to say I can't find which one of you lovely peeps inspired me and I've searched high and low in Blogland - if it was you, do please let me know and I'll add your name here. Time for a 'peek at the picks' from the last two weeks. I just cracked up at this terrific get well card, made by Megan! What great use of snippets too - following a super sketch that's just perfect for snippets. Barb is always coming up with great ideas and I think this card is really so clever. Do hop over to Barb's for more detail on how to make those wonderful little 'apertures' on the right hand side of the card - you could be surprised, I was! 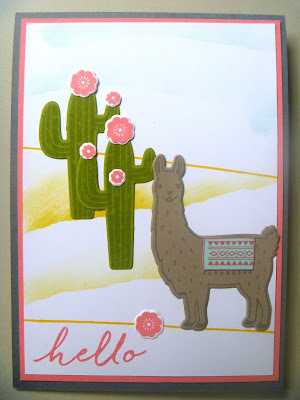 I really love this card, it's so CAS and a really great way to use up little snippets at the same time - made by Helen. Such a sweet birdie too! I think this is such a clever card, made by Pat! Perfect for anyone interested in chess - love the chess pieces and how dramatic is that chess board? 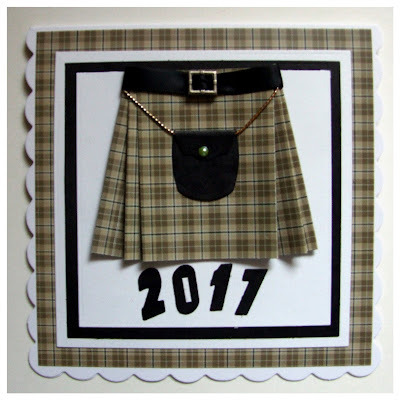 Gosh, Meg has a flying start on her Hogmanay cards for 2017! This is such a brilliant design for a card don't you think? All from a scrap of tartan patterned paper - a great kilt and I think a few of us could be copying this idea! I picked this card, made by Jane W, for the CAS design and also to show how you can get cracking on your Christmas cards! Once you pick a design like this I reckon you could set up a little production line for stamping, colouring, die cutting, fancy edge scissors (or dies/punches) and away you go. Plus some bling of course :) Super card! Alison brought this absolutely stunning card to share with us. A perfect example of what can be done with a piece of paper left from a session when Alison was playing with ink effects. 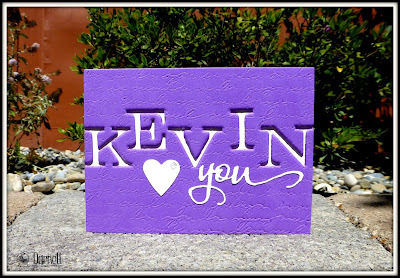 Plus, Alison also inlaid some of the die cuts - LOVE it!! 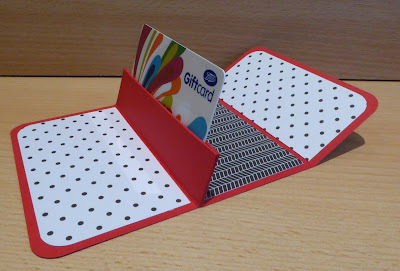 This brilliant pop up gift card holder was made by Liz - and there are really easy to follow photos of the steps on her blog post as well. Such a brilliant idea - I'd already earmarked this as an idea when our Sarn made a holder a few weeks ago - no excuse now! Which reminds me - Darnell's trip to England from mid-July is fast approaching so do go and see if she's likely to be within reach on her visit. First stop is Southampton - yay!! Wonderful quilling Connie and such a gorgeous design too. Hope you come back often to play with us, I see you joined in again during week 232 - which means the girlies must have been kind on your first visit :) Mind you, they really are the sweetest bunch of bloggers and make the Playground a happy and supportive place to come and play each week. It's been a good few weeks since Kath last won so this was due :) I still have your address here Kath and will post your prize off ASAP. The Snippets Challenge will run for one week and the Playground gates will close at 11am UK time on Saturday 18th June. The gates will open again at midnight UK time on the same day. Just realised, it's our local village carnival on Saturday 18th June - which may have an effect on things. Certainly the Playground gates will close and open as usual as I can arrange/schedule that ahead of time - my snippets card will be here along with the new Mr Linky and details of the new week's prize. But, I may not have a chance to do the prize draw for the Sunday Snippets post - and possibly not the weekly picks. I'm loathe to alter the Playground closing and opening times so there's a chance you might have to hop back on the Monday or Tuesday to check out the winner and possibly the picks. I'll do my best but have a feeling that we'll be helping out on the Saturday morning ready for the afternoon's fun and games! Just hope we have good weather! A maximum of ONE entry and please say in a comment if you wish to play and be a possible winner of the prize. If you only want to play for either of the die sets or the stamp set then just say so in your comment and if you win then I'll do a further draw for the other item(s). But, it's one whole prize if you wish. Please also link back to the Playground in your blog post to be eligible for the draw. Wishing you all a lovely week, with more sunshine and certainly no flash floods! I hope this post works OK, for some reason whenever the mouse floats over the post in edit mode stuff jumps here and there! I've been and tweaked some rogue HTML but am loathe to tinker further. It's jumping round like a jack in the box even as I type this closing sentence!! I'm OFF! !